It took a lot of imagination for Susan and Simon Barry to appreciate the potential of a Victorian cowshed and three stables advertised for sale in their local newspaper. When they went to view the derelict buildings, it was clear that a lot of work would be needed to turn them into a habitable family home. 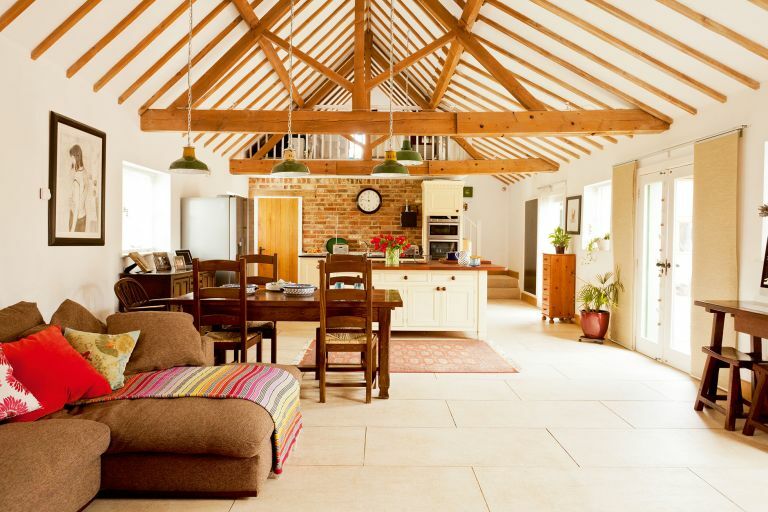 As so many renovations were necessary to make the stables and cowshed habitable, the couple continued living in their home in central Tewkesbury for a year during the major structural changes. Although Susan was pregnant with their second daughter Gabriella by that time, both she and Simon were keen to be on site as much as possible to advise on the build. The couple had hired structural engineer Andrew Marcham to help with the redesign. All of the buildings needed to be re-roofed, the floors had to be excavated and re-laid with sandstone tiles as well as French oak floorboards and all of the windows needed to be replaced. ‘There were eight external doorways leading from the buildings originally. We didn’t need that many, so we reduced them to two main entrance doors and two sets of French doors opening out to the courtyard area,’ says Susan. ‘We turned the others into large windows. All of this work had to be done before Susan and Simon could even think about rewiring and plumbing, constructing new walls and replastering walls and ceilings. Meanwhile, the builders were busy constructing new walls in the kitchen area to define the utility room and mezzanine; plus other walls to replace the wood cladding in the wood shed and to divide up the rooms in the hayloft. Stud walls were built on all external walls for insulation. The couple had planned to move into their new home in early summer, around seven months after starting the build work. However, when the new kitchen joinery arrived they found it didn’t match their original specification, with the wrong colour units and worktops, so they had to be re-made, which delayed the project. Susan and Simon had invited friends and family over at Christmas that year, so even though the renovation project wasn’t completed by December, they needed to move into their new home that month. It posed a major problem, however – there was still no staircase or kitchen. However, there were still lengthy delays to installing the staircase, so the couple decided to hire a different company to build it, choosing Sturdy Joinery in Bromsgrove which made the stairs from solid oak to match the other oak woodwork and beams in their new home.